If you’re driving, you might be embarking on a long journey. 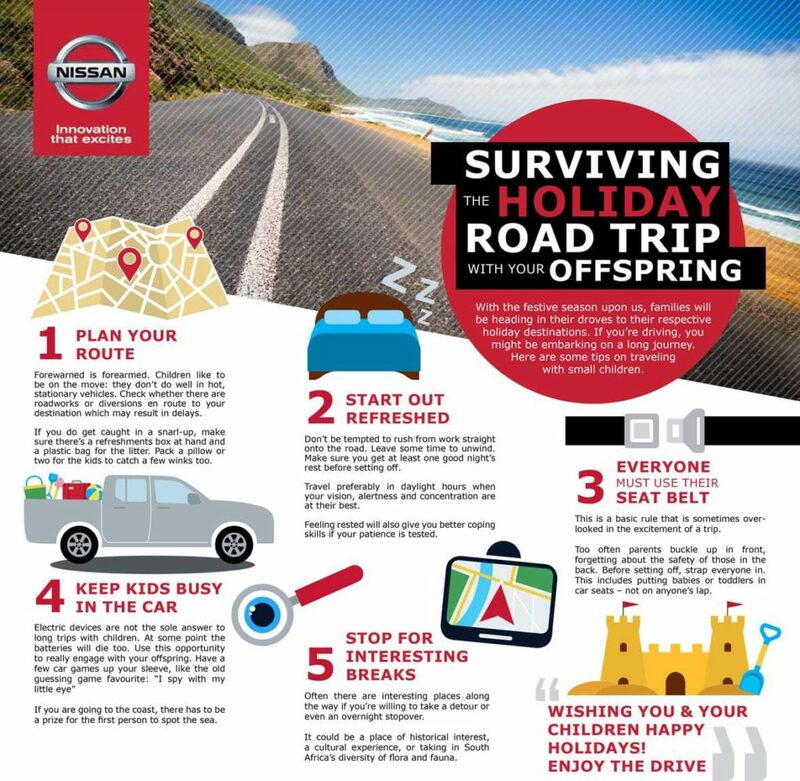 Nthabiseng Motsepe, General Manager, Corporate Communications gives some tips on travelling with your family this holiday season. While we all love time off with our families, a family vacation may require more time-off afterwards than anything else. And the truth is that going away at the end of a busy year can be one of the worst times to take to the South African roads. There’s more traffic on the country’s main roads, it’s in the middle of generally hot summer and an added stress is that the “silly season” often comes with some silly driving. So there’s a lot to contend with even before bringing kids into the equation. The best tip might just be to have a holiday in your home town, but I’ll deny that if your kids ask whose idea that was. Forewarned is forearmed. Check whether there are roadworks or diversions en route to your destination which may result in delays. Just because it’s the festive season, you can’t afford to let down your guard. You’re carrying precious cargo that needs to be delivered in one piece. Don’t be tempted to rush from work straight onto the road. Leave some time to unwind. Make sure you get at least one good night’s rest before setting off. Travel preferably in daylight hours when your vision, alertness and concentration are at their best. Feeling rested will also give you better coping skills if your patience is tested. This is a basic rule that is sometimes overlooked in the excitement of a trip. Too often parents buckle up in front, forgetting about the safety of those in the back. Before setting off, strap everyone in. This includes putting babies or toddlers in car seats – not on anyone’s lap. If occupants are not wearing a seat belt and the vehicle stops suddenly, the forces of gravity take over and they’re flung forward. I don’t have to paint a picture of some of the devastating consequences. Counting games are also a good distraction – whether it’s cars, trucks, telegraph poles, bridges. Or number-plate spotting. This is where a little imagination might go a long way in easing tensions and passing the time. You can even award prizes – only to be dished out (to everyone, of course!) at the end of the journey. And of course, if you are going to the coast, there has to be a prize for the first person to spot the sea. It’s not a race to see who gets to their destination quickest. Often there are interesting places along the way if you’re willing to take a detour or even an overnight stopover. It could be a place of historical interest, a cultural experience, or taking in South Africa’s diversity of flora and fauna. Let everyone go wild taking photos on their favourite device, creating memories they can share with family and friends. From everyone at CMH Nissan, wishing you and your family happy holidays. Enjoy the drive!